With the recent signing into law of the Telecommuting Act of the Philippines, working from home or telecommuting is expected to boost in popularity. Given the severe traffic conditions in Metro Manila, working from home really does sound very attractive not only for the employee, but for employers as well. Allowing work from home not only gives the employer potentially significant savings in office space but can also improve productivity by over 10%. Employers who allow their staff to work from home also see increased worker satisfaction and lower attrition rates. Answer office phone calls from anywhere in the world. Collaborate with other employees for free via instant messaging, video conferencing or teleconferencing. Utilize project management and collaboration tools. Instant Messaging –Facebook Messenger, Yahoo Messenger, etc. 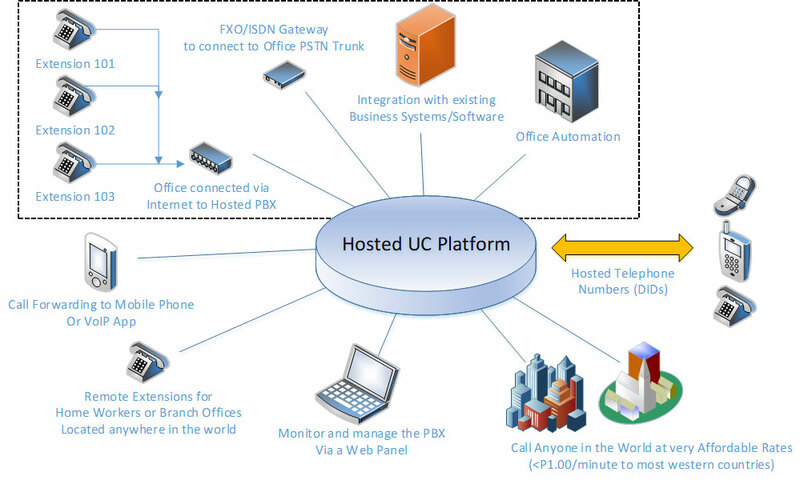 A step up from using free tools above is availing of a Hosted Unified Communications Platform. A hosted platform allows you to have a full featured UC System without the capital expenditure and technical expertise needed for setting it up and maintaining it on-site. It is a more secure solution than using free/freemium tools, and is fully integrated system where all components readily communicate with each other (i.e. email<->sms<->messenger). It is a more formal/professional configuration, indistinguishable from a traditional office communications system. Our sister company, Elisha Telecom, has been offering a Hosted Unified Communications Platform for over 12 years now. Starting at less than Php 350.00/month per user, they offer a very affordable entry point to Unified Communications that will allow your employees to work from home efficiently. Contact Elisha Telecom and get a free demo today. This Article was based on the presentation: Remote Working and the Virtual Office, presented during UCX Asia 2015 at the SMX Convention Center.